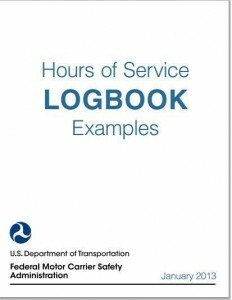 A free publication, dated January 2013, called, “Hours of Service Logbook Examples” is available in Adobe .PDF format from the United States Department of Transportation, Federal Motor Carrier Safety Administration (USDOT, FMCSA). Most of these examples only apply to property-carrying vehicles, not “livery” or carriers of passengers. Some examples for passenger-carrying vehicles are found at the end of this publication. The purpose of this guide is essentially limited in scope to upcoming changes (barring any legal adjudication between now and the effective date of compliance). If you are not sure how to “run a logbook,” then please see our Hours of Service guide for drivers. Hours of Service is the number one violation area in DOT rule enforcement, with fines running up to $200 per day. A new restart provision. After midnight June 30, 2013, a driver may not take an off-duty period to restart the calculation of 60 hours in 7 consecutive days or 70 hours in 8 consecutive days until 168 or more consecutive hours have passed since the beginning of the last such off-duty period. The effective compliance date for the new restart provision is July 1, 2013. The 16-Hour Driving Window is available once “weekly” to certain drivers (generally what is called “local delivery), and is not available to all drivers (refer to 49 CFR, Section 395.1(o)). Co-driver in passenger seat. There is an example showing the change in the definition of on-duty time that allows a driver in an in-motion or moving property-carrying commercial motor vehicle (CMV) to spend up to 2 hours in the passenger seat immediately before or after 8 consecutive hours in the sleeper-berth (S/B), and properly classify this as off-duty time. Mandatory 30 Minute Rest Break. This new rule prohibits driving if 8 hours or more have passed since the end of the driver’s last off-duty period of at least 30 minutes. The compliance date for the 30-minute rest break provision is July 1, 2013. “Waiting Time” at Well Site. This rule covers drivers servicing wells in the oil-patch. Waiting time at a well sit is off duty and extends the “14-hour” limit. The ‘waiting time’ must be shown on the paper log or electronic equivalent as off duty and needs to be documented or identified by annotations in the remarks section of the log as “Waiting time at well site,” or a separate line added to the log grid. The effective date for the revisions to the oilfield exemption in Section 395.1(d)(2) was February 27, 2012. This is more of an “advanced” level publication and, in my opinion, is not a publication for someone who is a beginner in learning the rules or who is not already “fluent” in the art of logging. Logging is a skill that is best learned by practice. Barring the results of any pending litigation, the publication is a good introduction and reference to recent or upcoming changes in Hours of Service rules.